On March 5, 2018, Mr. Anthony Bruscia, the Chair of the Frederick County Planning Commission, received a letter from the Maryland Department of Planning (MDP), as part of their “Local Plan Review,” with detailed and substantive comments from MDP and a few other state agencies (Maryland Departments of Housing & Community Development, Natural Resources, and Environment), regarding the draft of the Livable Frederick Master Plan. The introductory letter is copied below. CLICK HERE to open/download the letter AND the detailed commentary. Thank you for the opportunity to comment on Frederick County Planning Commission’s Draft of the Livable Frederick Master Plan Draft, and your participation in the State agency plan review process. The Maryland Department of Planning (Planning) believes that good planning is important for efficient and responsible development that successfully addresses resource protection, adequate public facilities, community character, and economic development. Planning’s attached review comments reflect the agency’s thoughts on the strengths of the County’s Plan, as well as potential ways to improve it and best satisfy the requirements of the State Land Use Article. The Department forwarded a copy of Frederick County’s draft Livable Frederick Master Plan to State agencies for review including, the Maryland Historic Trust and the Departments of Transportation, Environment, Natural Resources, Commerce, Housing & Community Development, and Agriculture. To date, we have received comments from the Maryland Departments of Housing & Community Development, Natural Resources, and Environment; these comments are included with this letter. Any plan review comments received after the date of this letter will be forwarded to you upon receipt. Planning respectfully requests that this letter and accompanying review comments be made part the of County’s public hearing record. Furthermore, Planning also asks that the County consider our comments as revisions are made to the draft Plan, and to any future plans, ordinances, and policy documents that are developed in support of the Plan. 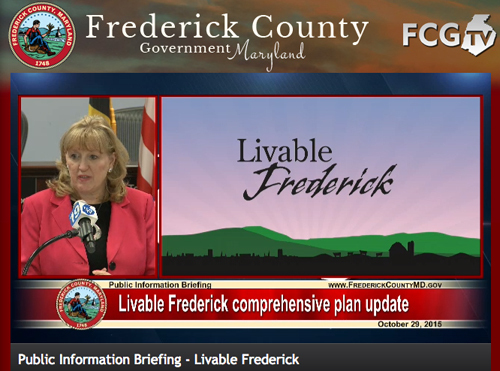 Planning is eager to provide support or clarification in the continued development of Frederick County’s Livable Frederick Master Plan. Please feel free to contact me at (410) 767-1401 or Joseph Griffiths, Manager of Local Assistance and Training, at (410) 767-4553.